I wanted to take this opportunity to introduce you to a few of my recent Fall acquisitions, starting with the amazing leather detail coat I'm wearing in this post. If I had to name the most essential piece of outwear every girl should have in her closet, a great black coat would be it. Aside from impeccable tailoring, fit and length, reason why I love this particular one, is the presence of those leather details. You know me, I can't live without a bit of embellishment! :) But in this particular instance, I feel that the leather collar and sleeves add a bit of an edge to an otherwise classic-fitting coat. Finally, I don't think it's a secret I am a little obsessed with cobalt. Ok, maybe a little more than obsessed:) But in my defense, cobalt is one of those amazing colors that pairs beautifully with just about anything. 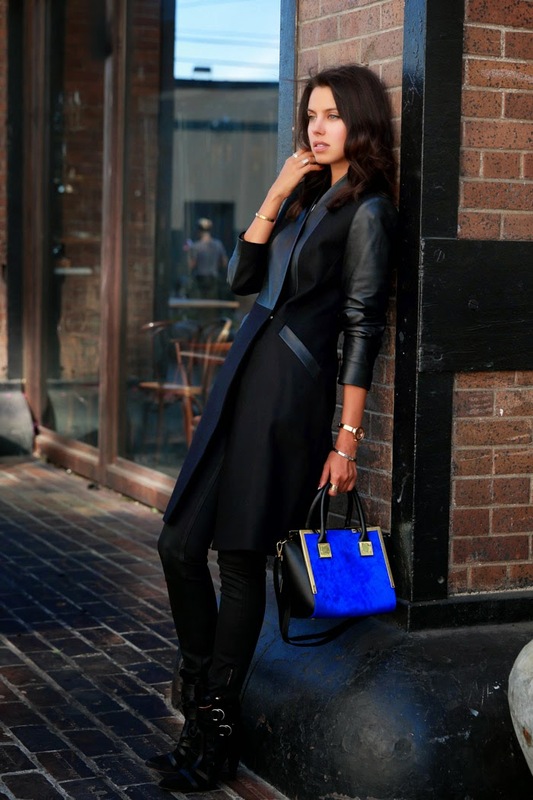 Naturally, once I spotted this gorgeous trapeze bag featuring bright cobalt front, black leather and metal corners, it was love at first sight! It's completely crazy but it looks great with everything in my closet! Seriously! So, hopefully you won't mind seeing quite a bit of this bad boy on my blog in the near future:)!